Gwen Frostic Woodland Shade Garden, showing plants that love shade and clay. Kenneth E. Nelson Carnivorous Plant House, the only garden of its kind in the U.S.
Earl and Donnalee Holton Arid Garden, with a focus on plants that prefer dry environments. Grace Jarecki Seasonal Display Greenhouse, which features a changing display. Earl and Donnalee Holton Victorian Garden Parlor is a step back in history. 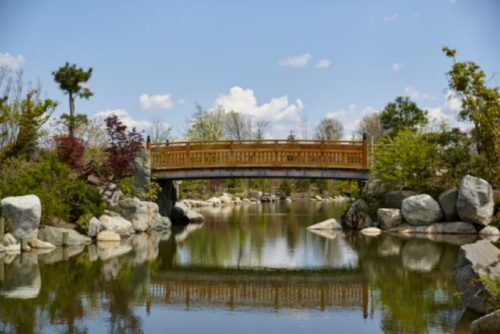 Richard & Helen DeVos Japanese Garden is eight acres of breath-taking vistas, no matter the season. The Wege Nature Trail leads through a forest. The Frey Boardwalk provides access to natural wetlands. Along the way are bird watching sites and a tadpole pond. The 30-acre outdoor sculpture park contains more than 50 works of art by luminaries such as Auguste Rodin, Mark di Suvero and Ai Weiwei. The collection includes the 24-foot bronze The American Horse by Nina Akamu. Indoors the collection includes Gilded Champagne Gardens Chandelier by glass artist Dale Chihuly and Dancer Looking At The Sole Of Her Right Foot by Edward Degas. 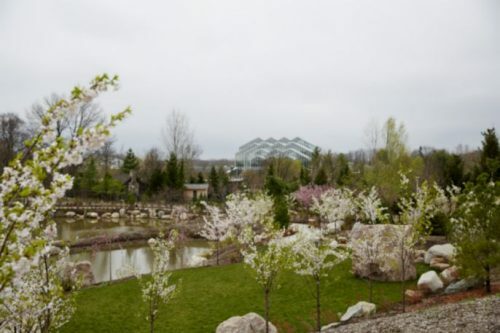 Due to a $100 million, five-year construction project, the outdoor tram tour will be unavailable and some detours are in place, so plan on a good pair of walking shoes and weather-appropriate attire.